Shredded Sweet Potato and Carrot mixed with cheese, flour & eggs. 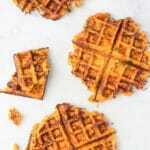 Cooked in a waffle machine, making them a great finger food and perfect for the lunchbox. Place 2/3 - 1 cup of the mixture in the centre of the waffle machine and spread a little to the sides. Close and cook for approx. 5 mins, until browned, crispy and cooked through in the centre. Remove from waffle machine and place on a wire rack. I used a food processor to grate the vegetables which I believe gives the best results. If you use a box grater then the vegetables can become mush and clump together. This will depend on how sharp your box grater is and the force you use. If very wet, I recommend squeezing some of the juice out (using a cheese cloth / clean dish cloth) before mixing with the flour and egg. You can easily change the vegetables you use in this recipe. I have, in the past, tried a mixture of grated onion, capsicum (bell pepper), zucchini (courgette). If adding other vegetables I recommend squeezing the juice out before mixing with the flour and egg. Nutritional information is an ESTIMATE only, calculated using an online nutrition calculator. It should be used as a rough guide only.